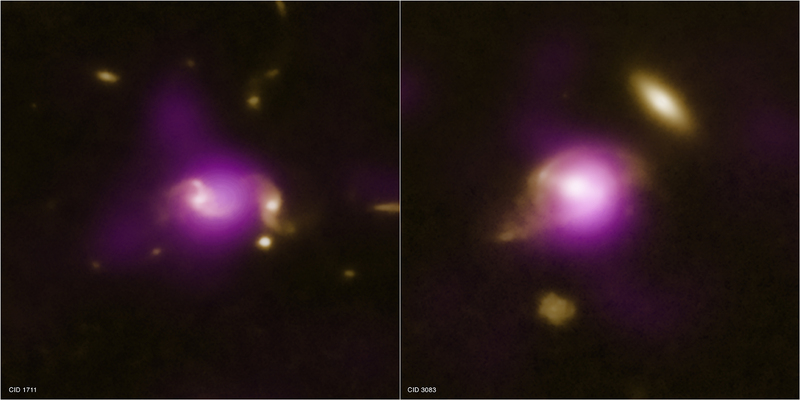 Close encounters between galaxies appear to trigger the black holes in their cores to grow rapidly. Astronomers studied thousands of galaxies - some in pairs and others that were isolated - as part of the large COSMOS survey. Results demonstrate that galaxies in the early stages of an encounter with another were more likely to have actively growing black holes. Astronomers have used a large survey to test a prediction that close encounters between galaxies can trigger the rapid growth of supermassive black holes. Key to this work was Chandra's unique ability to pinpoint actively growing black holes through the X-rays they generate. The researchers looked at 562 galaxies in pairs ranging in distances from about 3 billion to 8 billion light years from Earth. They found that the galaxies in the early stages of an encounter with another were more likely than isolated, or "lonelier" galaxies to have actively growing black holes in their cores. 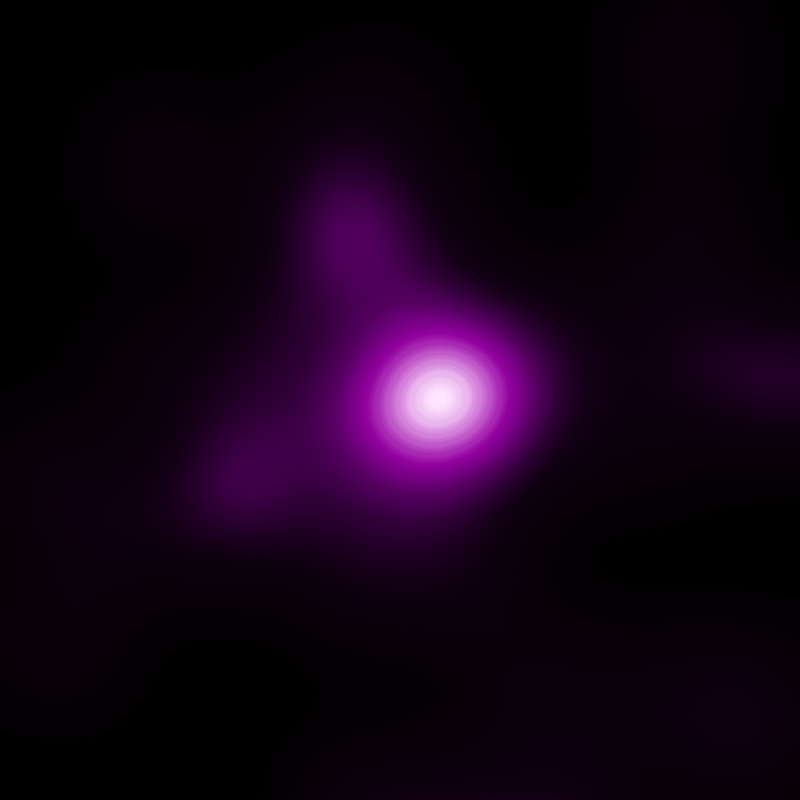 Credit X-ray: NASA/CXC/IPMU/J.Silverman et al; Optical: NASA/STScI/Caltech/N.Scoville et al. Coordinates (J2000) RA 09h 59m 34.658s | Dec +01° 56´ 51.24"
Coordinates (J2000) RA 09h 59m 21.53s | Dec +01° 55´ 45.18"
I really do commend the Chandra Digest team for the manner in which they have gone about openly presenting the feacts and pictures and the attached research articles and scientific details. I would like to also see some interactive desktop support with a small knowledgeable team that can interact and respond to enthusiasts such as myself. The matter of the black holes seems to have bi-polarity and each of these seems to be able to just fuse with each other. Like +ve and -ve polarized water. This may be a factor as to why most galaxies have 2 black holes spinning around each other ate the centres of the galaxy. Yet in reality with multiple galaxy collisions over the billion of years there should me many systems with Multiple Black Hole cores. So it seems like the like polarity black holes fuse like water droplets. Thereby creating only bi-polar systems. The issue seems to be inverse to that proposed initially. Thus, the galaxies would create black holes are formed as a function of jet energy expelled by the first galaxy (mother), has collapsed. The gravitational pull would cause the vacuum which, in turn, would again attract the elements around him. For example, an explosion causes the movement of everything around you so expansive. Ceased the explosion, the vacuum caused immediately return to be filed by the same materials. 6.7 billion light years from Earth. X-rays from Chandra and optical data from Hubble Space Telescope. CID 1711 363,000 light years and CID 3083 249,000 light years. X-rays are purple and the optical data are yellow.